There was a time when any old memory card would do but today there’s a huge range of SD memory cards to choose from and the price per gigabyte is ever falling. 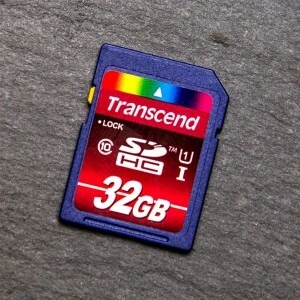 In this group review I’ll be looking at five 32GB SD cards which all claim to offer super fast speeds and all retail for less then £26.00. At first glance all these class have very similar specifications. They all offer class 10 performance which in itself isn’t that impressive now a days. 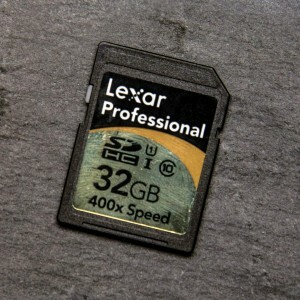 In fact they all claim to offer write speeds of around 45MB/s which makes them the perfect choice for DSLR video and shooting bursts of RAW still images. All the cards also read speeds of at least 60MB/s and that’s good news for everyone (with a USB3 card reader) as it massively reduces the time spend downloading images and videos from the card. On paper this card looked every bit the winner and it doesn’t disappoint. Transcend also add in a 12 month licence for RecoveRx recovery software extra piece of mind. The only blot on the Transcend’s copy book is a lack of protective case but with super fast speeds and a bargain price tag it’s an oversight that’s easily forgiven. 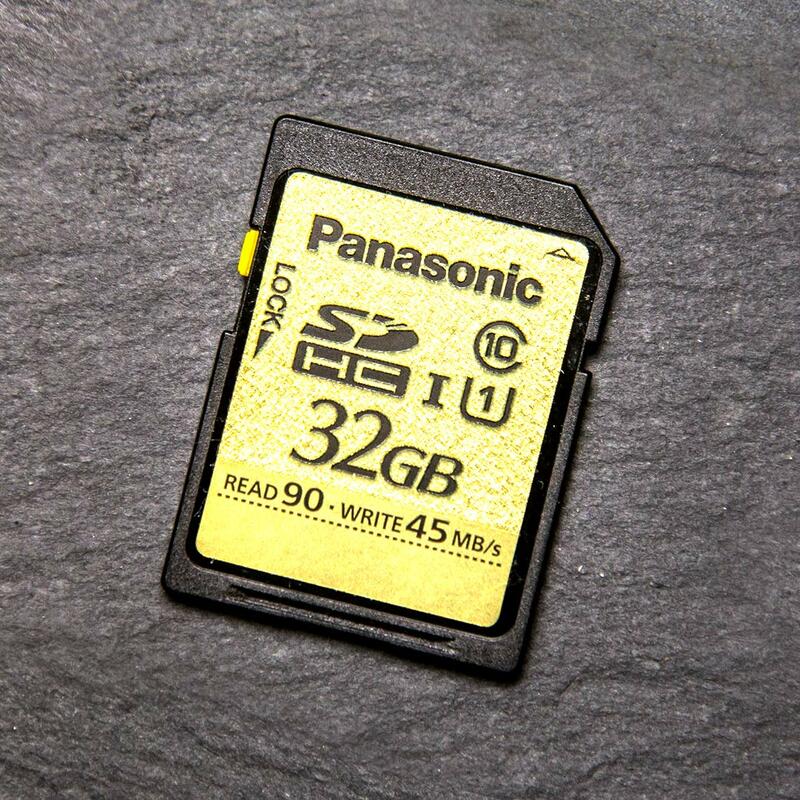 Panasonic is not a name I previously associated with memory cards but it is a brand that’s well known. The memory card itself performed rather well with some excellent results. Sure the read speed missed the claimed 90MB/s but the write speed was better then claimed by the exact same amount. Sadly there’s no recovery software or protective case here although if the claims on the packaging are to believed you’ll never need it. Panasonic say it’s resistant to water, shock, magnets, x-rays, electrostatic and temperature. I’ll let you test all those claims out but it certainly with stood the usual treatment I dish out to my cards… as did all the other cards in this test. Lets start with the positive points. The Lexar card comes with both a protective case and downloadable data recovery software. There’s also a very fast read speed of over 80MB/s which puts it up with the best in the read department, which is odd as Lexar make no mention of read speeds on the box. The box does promise a “guaranteed minimum write speed of 60MB/s” which sadly I wasn’t able to achieve. In fact the best I could get was a pretty average 49MB/s. To be fair Lexar does say, in the tiny small print on the back, that the minimum guaranteed speed depends on your equipment. That said it’s worth remembering, all my testing was done on the same machine with the same equipment. Sandisk has been the first choice of many professional photographers, me included for many years. However in this group review the Sandisk Extreme is looking a bit out of its depth. The claimed write speed was very close the actual speed but unlike all the other cards in this review, the read speed is no faster then the write speed. To be fair to Sandisk it is exactly what they said it would be but it’s still almost half as fast as the best card in this review. All in all the Sandisk Extreme is a safe bet but there are currently better options out there when it comes to read speeds. Someone has to come last and sadly, in this test, it’s the Samsung Pro. Not so long ago its 40MB/s write speed would have been top class stuff but now it looks, at best, very average indeed. The read speed is also slightly off the mark too. No recovery software and no protective case don’t help matters either and when you discover the price is at the higher end of the scale it’s game over for the Samsung Pro. It’s also worth noting the eyewateringly high price for US buyers! There is however one area where the Samsung beats all the other cards in this review and that’s in looks. I love the engraved surface on this card. Click the image below to see the benchmark results for all the cards. Great article. One thing that got me was the US price for Panasonic and Samsung cards. The others were similar in price but Panasonic and Samsung were a good $90+ extra. For US people I did find the winner, from Transcend, for $32.84 at Walmart http://bit.ly/ZHZNDV and ordered it. Top review Gavin, very informative and helpful. Keep the great work your doing. 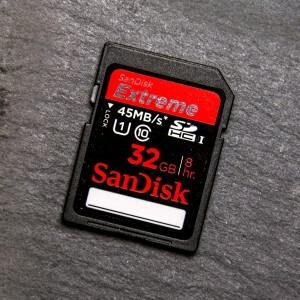 For what it’s worth, the SanDisk card is also resistant to water, shock, magnets, x-rays, electrostatic and temperature. However, you would only know that if you look at the physical packaging. Why they left that out in online details is puzzling. Almost all the cards make similar claims but as you rightly say, some manufacturers make a bigger deal about it then others. Gavin what reader are you using? is it connected with USB 3.0 or 2.0? It’s a Lexar USB 3 card reader. If you use a USB 2 reader or port then your max speed will be capped far lower then the card can perform. Great post Gavin! I own two of the 16GB version of the SanDisk 45mb/s cards. 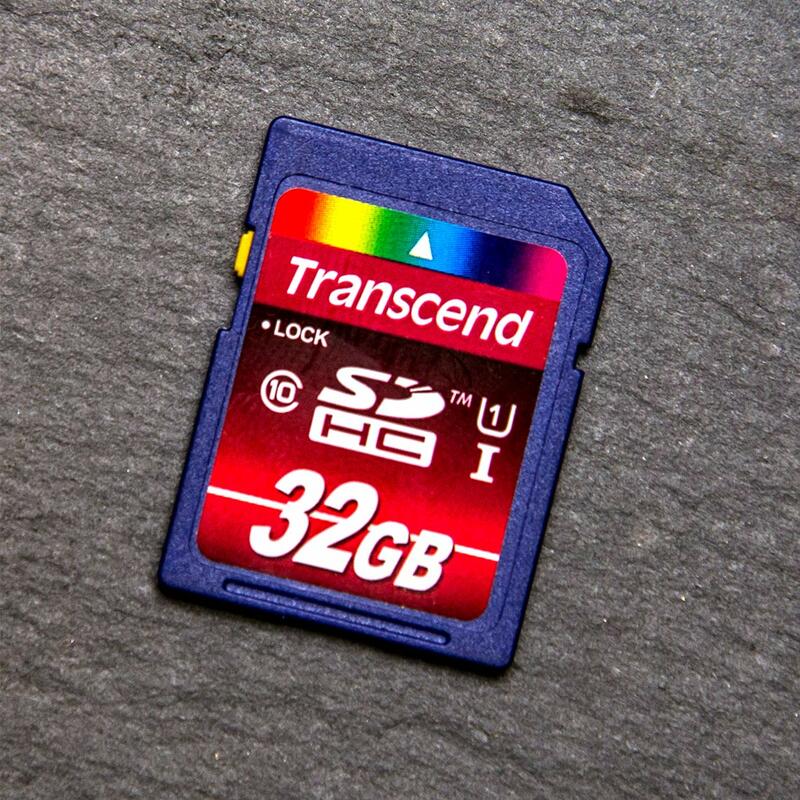 Glad to see that they do JUST live up to their 45mb/s branding but I really should look into those Transcend ones! Hi Gavin, can I ask the name of the software you used to benchmark the SD cards. Thanks. I use ATTO benchmark to test my memory cards and hard drives. Hi Gav, great article – it’s a real eye opener! Any plans for a similar experiment for Compact Flash cards? Would love to see that too! Keep up the good work! Cheers, Paul. 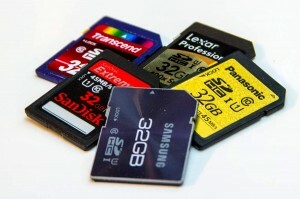 great article and definitely a good guide for buying new SD Cards. Do you have any personal long-term experience for the Transcend Ultra-Speed Cards? I’m from Germany and on amazon.de a lot of people complain about very low write speeds after a few weeks of usage. Can you comment on that? It would be nice to have an idea of how robust the cards and and which is more likely to fail first. I really don’t want to lose 32GB of images! That is why i always recommend buying a few 16GB cards instead of one 32GB. 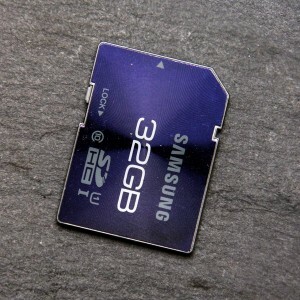 Swapping may waste a few seconds but hey, if anything goes wrong, at least you won’t be loosing all 32GB worth of photos! Thanks for the writeup, but what is interesting is the Transcend looks like the worst performance for 32 MB and smaller files based on your graphs, which would be most RAW files. So it appears to be faster for writing large files, but in the case of smaller files the Sandisk or Lexar look much faster? It might just be how I am reading the graphs though. RAW files are generally big files even jpg’s cane be a couple of mb in size making them big in terms of the benchmark test files. Those graphs are showing KB on the Y-axis, so you’re looking at the numbers for 32KB and less. So not a big deal for cameras, even if consistently slower at those file sizes.